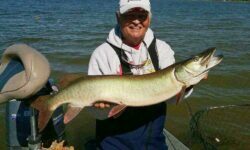 Home Posts tagged "Muskie Fishing"
Muskie Fishing Lake Minnetonka is a popular activity for many in the area and surrounding states. Tyler and Ryan Mahoney decided to give it a try in early fall. But it’s not for the faint of heart. You need to be mentally prepared to spend hours and days before even getting an opportunity at hooking a fish. Luckily, there is a healthy Northern Pike population in the lake as well. So if you’re having a hard time on muskies, there’s always a good chance you’ll hook into a good Northern instead! Be sure to stay updated by subscribing and following along on the Mahoney Outdoors Facebook Page!